REST SET: Our bows ship with a leather arrow rest and fur (vertical) strike plate installed. These replacements are specific to shooting orientation so be sure to select right hand or left hand accordingly. GASKETS: Let’s face it, as we age our gaskets wear out, and it’s no different for your bow. If your gasket is worn, please replace it. Worse yet, if you do not have one or both of your gaskets, please do not shoot your bow without. This will cause unnecessary wear and tear (friction) on your limbs and handle and will affect the limb fit and quietness of your bow. STANDARD BOLTS: We sometimes see bows that have been assembled with make-shift (aftermarket) bolts. Please be sure to use only bolts designed for a Bob Lee bow. Our standard 1¼” limb bolts are threaded specifically for our takedowns to ensure precision limb assembly and alignment. 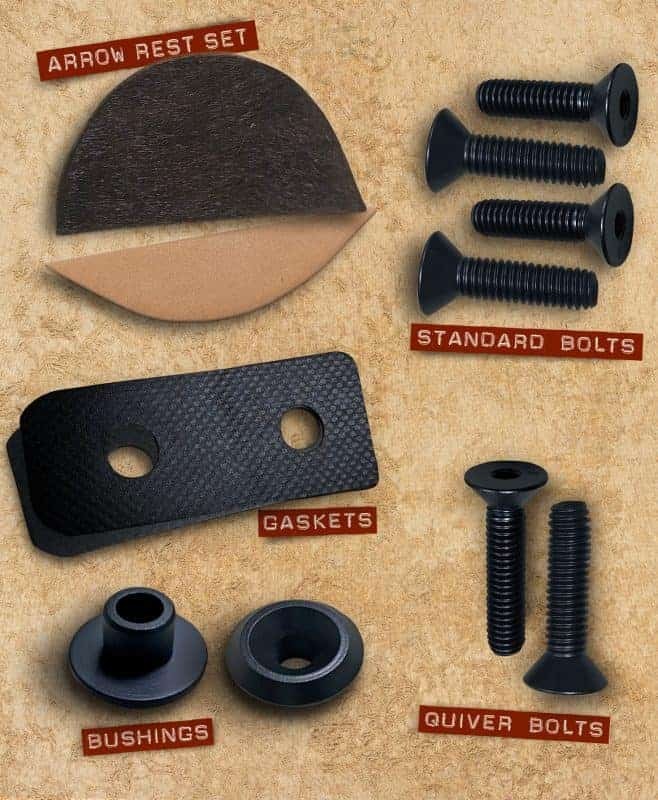 QUIVER BOLTS: These 1½” bolts are designed to allow attachment of a Great Northern Quick Mount Quiver by replacing two (not all four) of your standard bolts. BUSHINGS: This is one of those items that customers misplace, and we can understand that. Unfortunately, some choose to shoot their bow without bushings (bad decision). These bushings are very important to our limb assembly system, providing a buffer between the limb bolt and the limb cap to prevent abrasion and “wallowing out”.